Happy hump day, dear readers! This week is definitely flying by, especially since it is a short one due to the holiday on Monday. I've got quite a bit to share with you this morning, so I'm going to keep the chit chat short and jump right on in. Shall we? Let's do this! I am honored to be sharing with you the upcoming Substance Abuse Awareness Box, called Rachel's Rainbow Box. 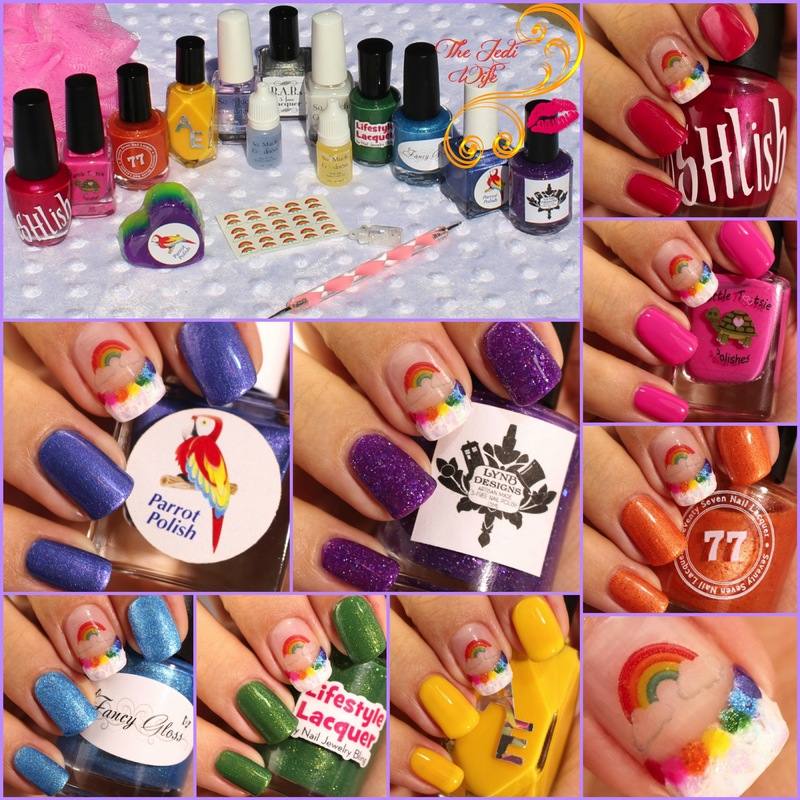 I've been part of the indie nail polish community for several years now, and one of my favorite things about the community, besides our mutual addiction to gorgeous nail polish, is the number of friendships and bonds formed. It is because of these friendships that Rachel's Rainbow Box has come into existence. The niece of a community member is very ill, and the family no longer has sick time to get away from work. As a parent, I know just how much you want to be with your child when they are sick. To help the family raise some needed funds, Mandy of @mandyluvslacquer has curated a box filled with beautiful polishes and extra goodies. With all the brands that signed up to participate, they were able to create a colourful rainbow. Let's check them out! First up is Love by PoSHlish! 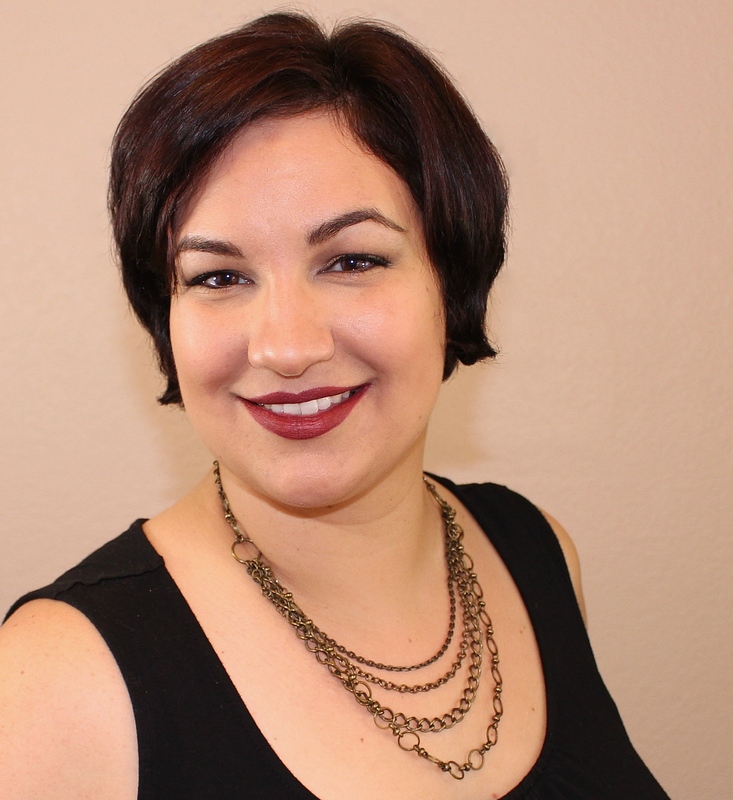 This shade is a gorgeous ruby red complete with pink undertones. It has a finely shimmered slight frost finish, although it doesn't quite have the brush stroke issues seen in frosts. My bottle did have some pigment suspension issues and a problematic brush, but these issues have been looked into and should not be an issue with future bottles. The formula is a little on the thinner side, and I did have to work very slowly with the brush issues. You may need to take caution to avoid cuticle flooding, but it is still a beautiful shade of red and well worth it! 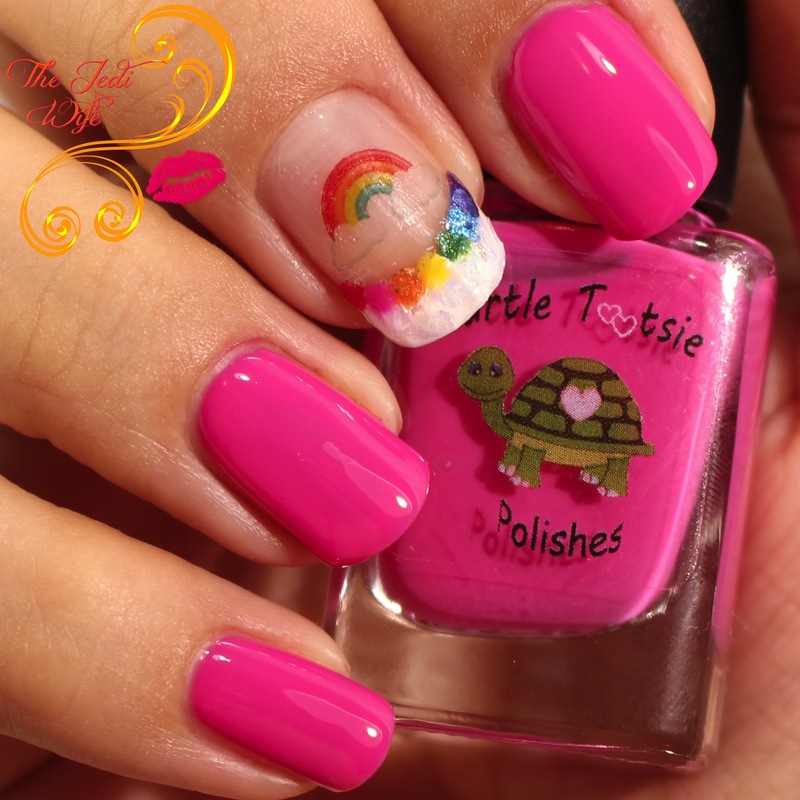 Hope is a beautiful bubble gum pink crelly polish. More pigmented than a jelly polish, Hope still has the squishiness that I just love! While pastel pinks aren't quite my thing, I can't seem to get enough of these darker shades! The formula was on point and I had no issues with the application. Hello, orange! Perseverance is a beautiful shimmery carrot orange polish with burnt orange micro flakes. This shade is perfect for the upcoming fall season, and I am so glad Seventy Seven Lacquer went this direction for the orange! The application was fantastic! 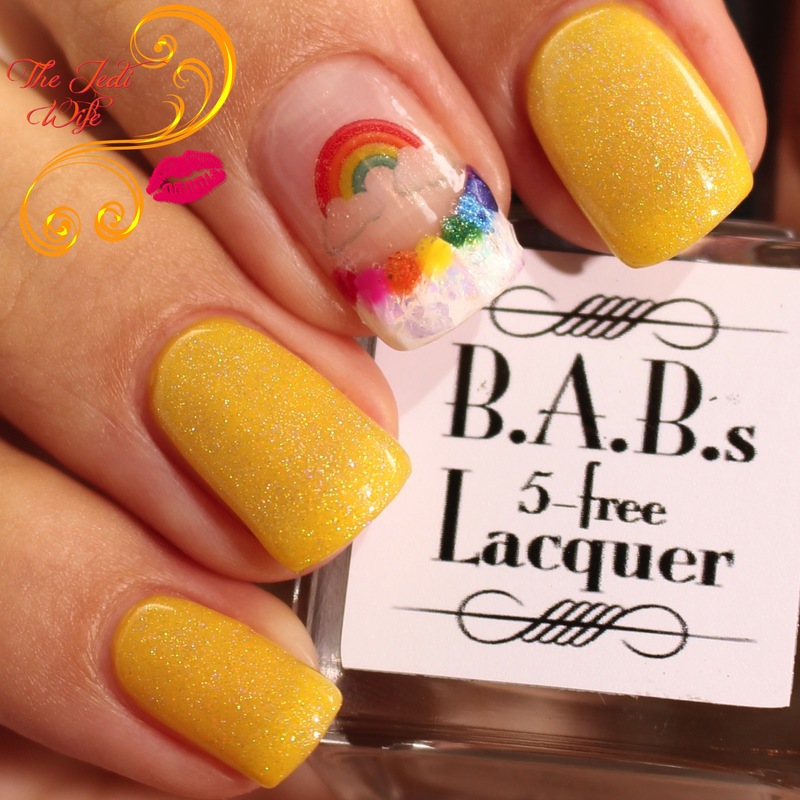 There is something so cheery about a yellow polish, and Alter Ego really nailed it! Joy is a sunny yellow jelly polish. It is on the sheer side, and I still had visible nail line with three coats. I personally like it like this, but you can either add another coat or two to reach opacity or you could layer this over another polish if you prefer fewer coats. It applied really nicely for me and I have no issues to report. 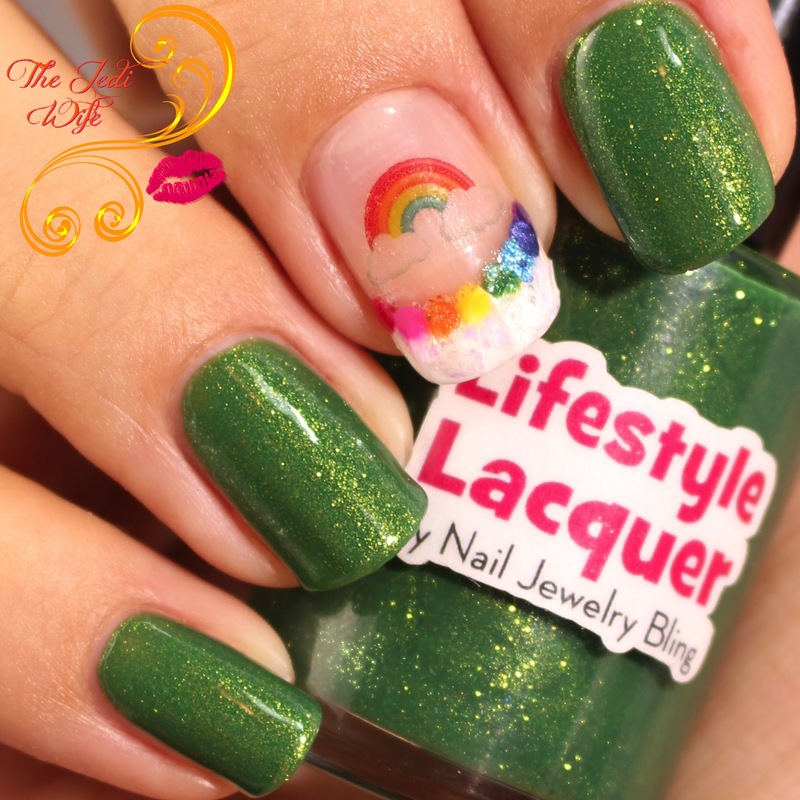 Courage is a green jelly polish with shifting green to gold shimmer. I love this shade of green, especially for the fall! Even though it is described as a jelly, I found it to be missing the squishiness of a jelly and thought it to be more of a traditional shimmer polish. However you want to describe it, the colour is fantastic and the formula is sublime! 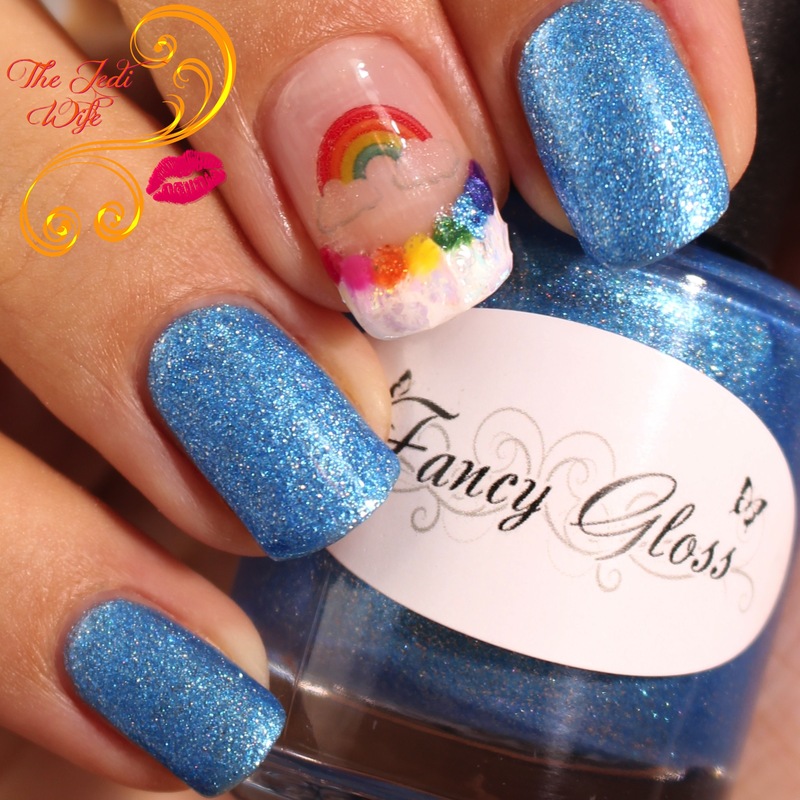 Power is a metallic blue polish loaded up with extra silver micro glitters and blue sparks. It photographed a little on the cooler side for me, and it is warmer in real person. The formula was fabulous and it practically applied itself! Valor is the perfect shade of indigo- not quite blue but not exactly purple either. This is a colour that often freaks out my camera and it photographs one directly or the other, but I'm happy to say this is colour accurate, on my monitor at least! Valor is very densely pigmented, and while I used two coats, I easily could have gotten away with a single buttery smooth coat. 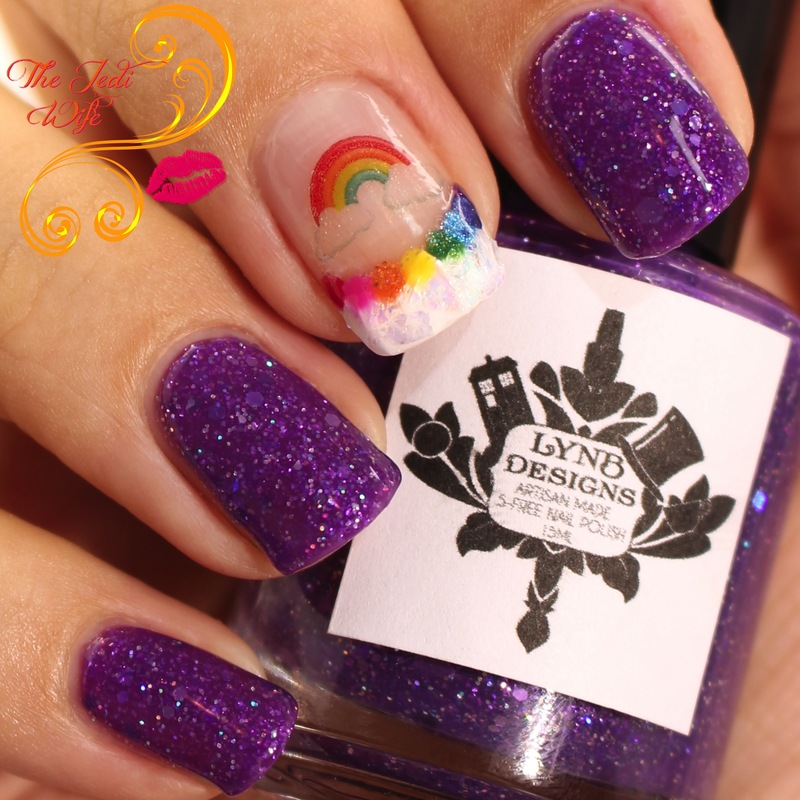 Strength is a grape purple jelly with purple-to-gold colour changing shimmer, silver holo micro glitter, and tonal holo glitter. It is a little on the sheer side, but it builds up nicely and covers nail line in about three coats. The glitters dispersed beautifully over my nails and I had no issues with application. 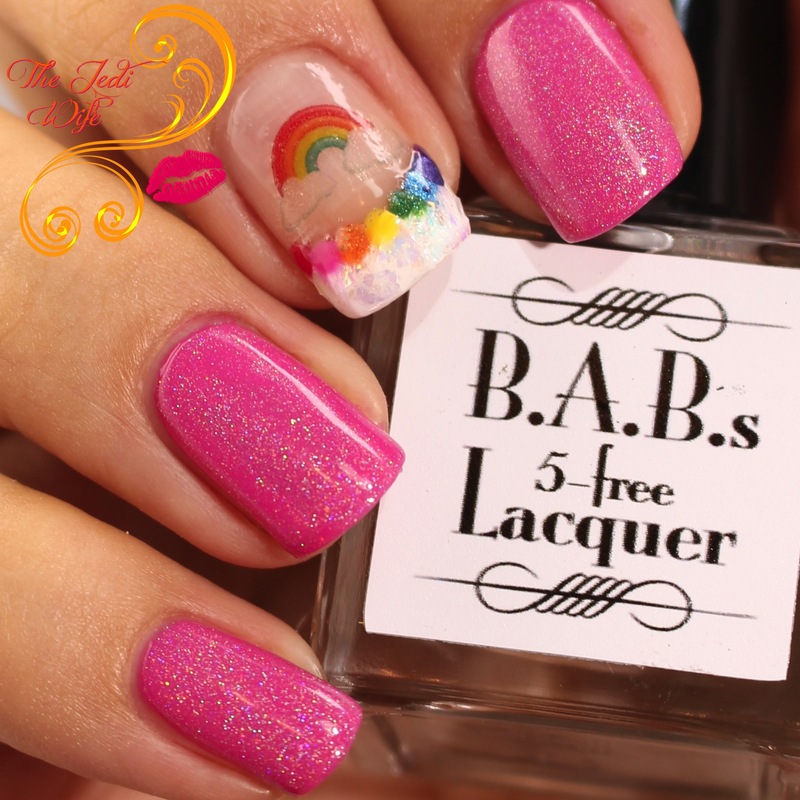 Rachel's Rainbow Box also includes a holographic topcoat so you can have rainbows all over your nails, even if you do use a single base shade. The particles are fine, and this doesn't grey base shades as much as other holo topcoats often do. The formula was so creamy and smooth! As you've been reading my post, I hope you've been enjoying my accent nail! 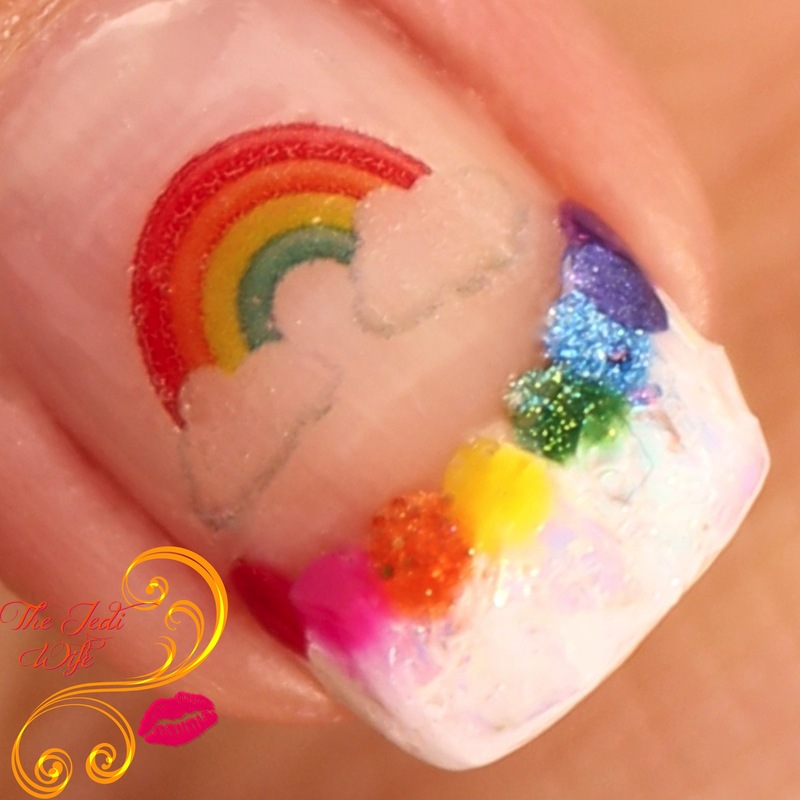 Each box also includes a sheet of 30 rainbow water decals, half with clouds and half without. I've not used water decals in a little while, but I love how easy they are to apply! Each box also includes a vial of mylar flakes provided by @mandyluvslacquer that I have used over my french tipped accent nail. 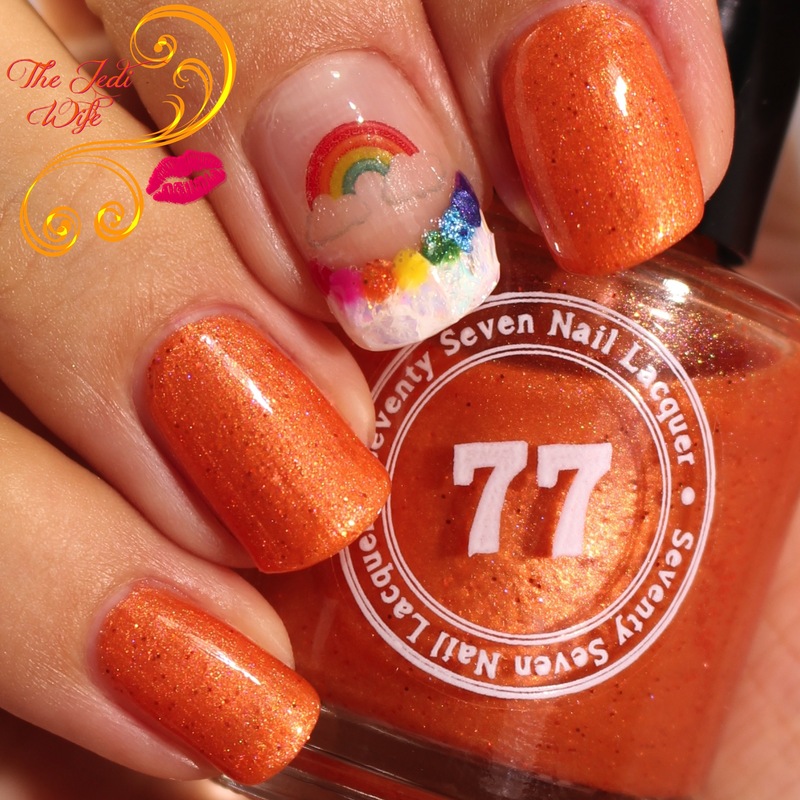 Seventy Seven Nail Lacquer has also contributed a dotting tool that I used to form the rainbow using each of the shades from the box. My nails were treated with All About This Base and topped off with Supa Kwik Quick Drying Top Coat, both products provided by SoMuchGoodness Nail Care in this box. 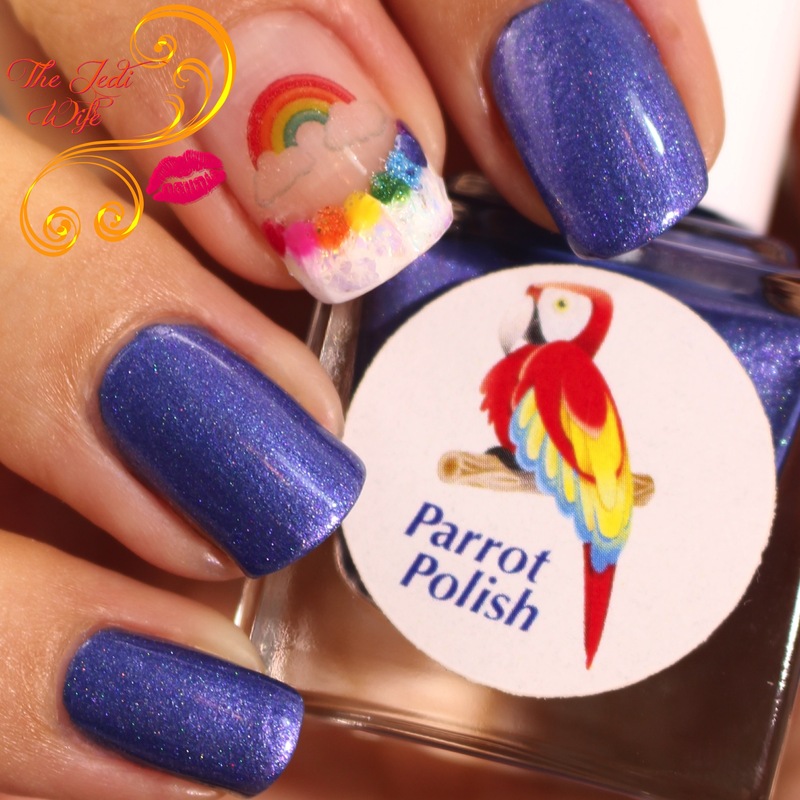 The box also contains an adorable heart-shaped rainbow-layered soap by Parrot Polish, a bath pouf provided by Alter Ego Body Care Products, and a mini cuticle oil and drying drops by So Much Goodness. Not pictured (because they were hiding from me until the last minute) but still included in the box is a small baggie of rhinestones provided by Lifestyle Lacquer by Nail Jewelry Bling. Rachel's Rainbow Box will be available for pre-order this Friday, September 9th on the Substance Abuse Awareness Collaboration Box website located here. This box will retail for only $65 plus shipping- that's a lot of goodies for one low price! The preorder will run until September 16th, and you don't want to miss out! Not only will you be receiving some fabulous items, you'll be helping someone in the indie polish family! For each box sold, $40 will be given to the family. What colours and products are your favorite from this box? I'd love to hear from you! These are all gorgeous and I love them even more for the good they are doing. Wonderful post and beautiful swatches! I love polishes for a cause! This is a worthy cause indeed. I love the rainbow theme too. Great swatches! All of them are gorgeous, you can't really pick a favourite! And such a gentle thought of all these indie makers. I have to say ALL of the polishes are great. I fi have to pick one colour, it's got to be the yellow, since i don't own a good yellow polish. 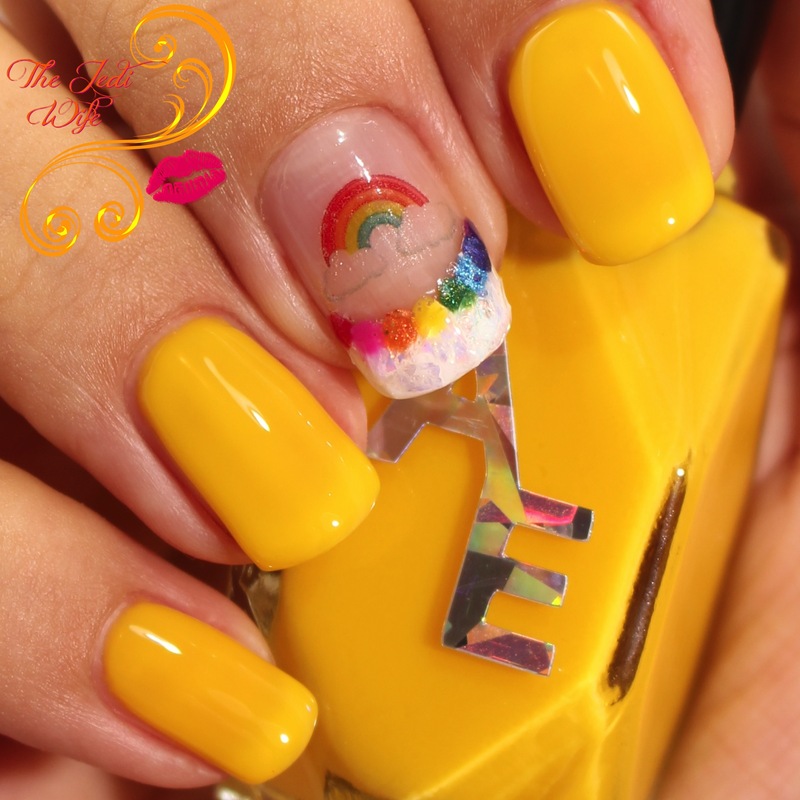 It was a really great idea to paint a accent nail - the rainbow are so fab! Beautiful swatches and box. I live the little rainbows! 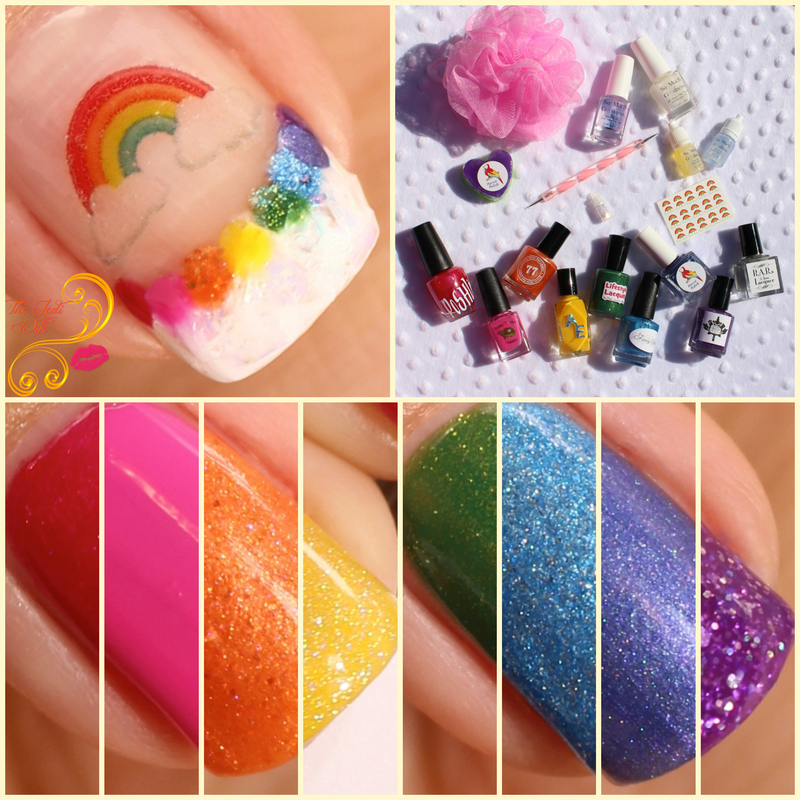 These are all beautiful, I love the rainbow! I think Courage is my favorite of the bunch though, it is really lovely! Looks like a great box for a very reasonable price! This is such an awesome thing to do. I love when the polish community pull together for a cause. Your collage is everything! Wonderful post! This looks like a great box! Rainbow all the things! This is a great looking box! I love a bunch of these! I love that accent nail you did! Beautiful post and polishes! Your accent nail always pushes me to do my own lol.